Watching a monster movie after a bad day in the office is perhaps the perfect form of therapy and Gareth Edwards’ Godzilla does not disappoint. 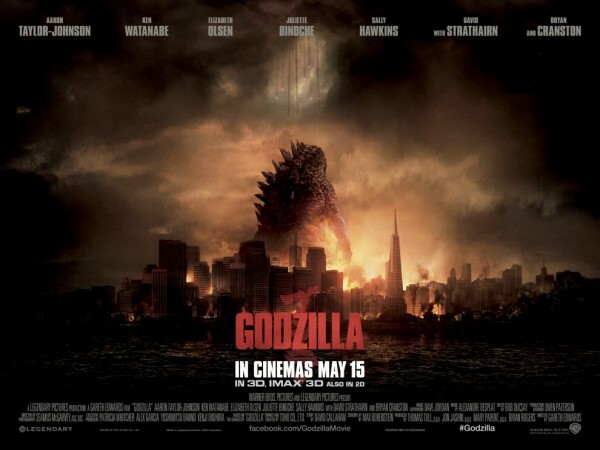 This film is all about the monster and standing at 355-feet-tall there is a lot of him to take in. Edwards is skilled at building dramatic tension early on and his opening credits are like a work of art. Both beautiful and captivating, they draw you into his world. He also knows the value of the reveal, waiting nearly an hour before displaying Godzilla in all his splendour. Edwards’ monster is something ancient, a force of nature that echos back in time to the beginning. Having lain dormant for years, feeding off the Earth’s radiation, man’s arrogance and destructive behaviour has awoken him. He rises out of the ocean like a loan warrior ready to do battle to restore nature’s balance. Edwards opens the films with a level of emotional intensity that is unexpected. The narrative begins in 1999 at a nuclear power plant near Tokyo. Joe Brody (Bryan Cranston) and his wife, Sandra (Juliette Binoche) are scientists. When Joe detects unusual seismic activity at the plant his concerns are dismissed which leads to a plant meltdown and Sandra’s death. 15 years later Joe is still looking for answers while his son Ford (Aaron Taylor-Johnson) is a bomb disarmament specialist and living with his wife (Elizabeth Olsen) and young son in San Francisco. After returning to Japan to bail his father out of prison, Ford begins to realise his father’s conspiracy theories may in fact be true. Cranston is wonderful as Joe and along with Binoche, they grasp at your heartstrings until you really care for this family. It is a shame they do not have more screen time together as they are without doubt the heart of this film. The rest of the cast while talented fail to have the same level of impact. Adams is an interesting hero but he lacks spark and both Ken Watanabe and Sally Hawkins’ characters suffer from being underdeveloped to the point that their main purpose is to provide exposition. However the real stars have to be the monsters and they are gloriously destructive and sinister. In a world where we live for our machines and technology this film taps into that primal fear that maybe we are not as secure on nature’s pecking order as we would like to believe. It feeds beautifully into our modern experience and provides us with monsters that turn our greatest weapons against us. If you go to see this you can expect multiple monsters, multiple locations and a lot of destruction. People always say it but do try and see it on the largest screen you can and if you have had a bad day you just might feel a little less stressed after watching a few cities being destroyed. I know I did. This entry was posted on Thursday, May 15th, 2014 at 11:18 am	and is filed under Features, Film, Review.